A chapter 13 bankruptcy, which involves a 3-5 year repayment plan, is almost always a better option for the financially distressed than the current status quo. I use the analogy of the ever-growing gobstopper. Without filing bankruptcy, you pay your monthly minimum payments on your credit cards. Because you’ve made those payments, you end up running out of disposable cash before your next paycheck. As a result, you use your credit cards again to pay for basic living expenses. For example: Your monthly minimum credit card payments are $950. A large chunk of that goes towards interest. Before your next pay day, you run out of cash and have to charge $950 for new tires and summer soccer registration for your kids. The gobstopper is bigger the next month even though you started it off by taking a big chomp out of it. On top of paying those monthly minimum credit card payments, you have a monthly vehicle payments totaling $400, medical bills totaling $150 per month, and a monthly student loan payment of $400. You pay $1,900 per month on debt, but are not getting anywhere. You make $4,500 take-home pay per month, but feel as though you are living paycheck to paycheck. You may never reach a point where you are unable to pay your minimum payments. However, if you look at the back of your credit card statement, you will find a little section that shows you how much you will eventually pay in interest and how long it will take to pay off the balance interest if you only pay the minimums, assuming you make no new purchases. If you were to pay 100% of all of your debt back, the total payment would be $45,000, which can be paid over 5 years. The monthly payment would be $750/month for 60 months. Even adding the student loan payment of $400 only brings the monthly total to $1,150, which is much better than paying $1,900/month. 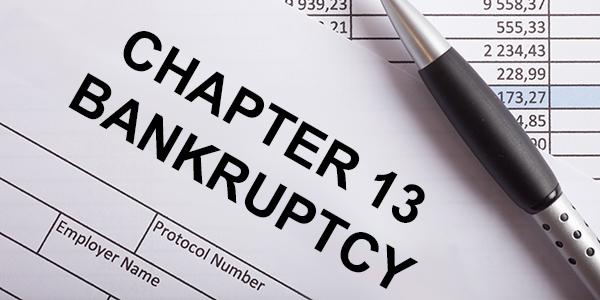 You can pay for your financed and leased vehicles through your Chapter 13 bankruptcy. You keep all of your property even if that property is not exempt and would be liquidated in a Chapter 7 bankruptcy. You can be debt free in 3-5 years. You pay most of your attorney’s fees through the plan. You typically pay less than 100% of unsecured debt through the plan without interest. The unsecured debt you don’t pay gets discharged (eliminated) at the end of your plan with some exceptions like student loans and some tax debt. If, through your plan, you only paid 50% of your credit card and medical debt, the other 50% would be discharged, meaning you would not be liable for paying that once you made your last plan payment. You keep making your monthly mortgage payments directly to your mortgage company. You make one payment a month that handles all of your debt (except for your mortgage payment and student loan payments). In most cases that payment is paid directly from your paycheck, which is convenient and stress-free. Figuring out whether to maintain the status quo or file for Chapter 13 can be overwhelming. Schedule a consultation today with one of our bankruptcy attorneys at Koenig│Dunne to discover why a Chapter 13 bankruptcy makes sense for you.